Mugenbine, which means "infinite combination", is type of building block set wherein the pieces are made of robots and parts of robots: extension arms and legs, wheels and weapons of robots. It is like other building block toys for children except that it is specifically designed to create robots, and each of the pieces, or many of them, are themselves robots. Children who play with Mugenbine make giant robots out of a selection of smaller robots and robot parts. The robots have faces. They are felt to be alive. Mugenbine is Lego for animists. 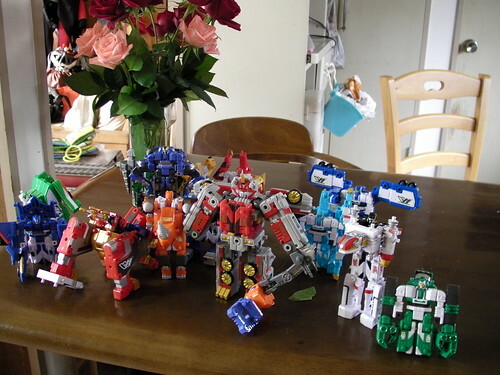 My son started out having a fascination for combinatory toys such as the combining power rangers toys where two to 12 robots combine to make a larger "Mega Zord." He has moved on towards a preference for infinite combination but remains fascinated with the same trope: animate parts combining to make a giant animate whole. Jacques Lacan says that young humans generally gain an idea of themselves in two ways. Firstly by looking at themselves directly and in mirrors and secondly by talking about themselves to themselves. He argues that the former, visual representations of self are more primitive. Lacan refers to the self as representated visually as "hommelette" which is on homme (man) with a diminutive ending meaning "little (as in primitive) man" and omelette with homme merged as a prefex suggesting "man-ommlette:" all jumbled up generally a mess like an ommlette. Lacan argues that the visual self is something that we must grow out of because it made up of a jumble of things without any cohesion. Our self views are still external and worse, incomplete, views of this and that hand. The view of ourselves that we see in the mirror presents a whole body but it is out there in the mirror. Added to that we have many views of self, a scrapbook of self views, that never add up to any sort of coherent unity, unless we can call an omlette coherent, and Lacan suggests that we can't. As my son makes more and more combinatory toys of made of parts which are like mirror fragments of the whole, mini-robots combining to make a bigger robot, I wonder if this play helps him to combine his self-views each semi-animate part-him, part-robotic, into a coherent self a mega robot that has more coherence and more humanity than an omlette.